Because we do not advertise, someone has told you about Red Rowan. You have arrived here at our website, so you probably already know that this is not the usual veterinary practice. Our focus is holistic – treating the whole animal rather than the disease or the symptom. Dr. Bamford practices wellness medicine as well as veterinary homeopathy and veterinary chiropractic. The clinic offers acupuncture as well as consultation in emotional control, behavior modification, nutrition and supplementation. This does not mean that we do not practice allopathic medicine at all. There are many useful drugs on the market and if they are indicated – and if they fall within your tolerance level – they can be prescribed. Dr. Bamford is an astute diagnostician and can perform most of the laboratory tests necessary to support diagnosis and preventative procedures. We have developed a broad referral network of trusted veterinarians, clinics, and referral hospitals who or which are devoted to performing the specialized diagnostics and treatments that we cannot offer here. In all referred cases Dr. Bamford will continue to oversee your companion’s care in a holistic manner. Many clients have found us because over-vaccination and the use of steroids or other chemicals to treat disease concern them. It is Dr. Bamford’s conviction that homeopathy can be used in many cases to treat the same broad range of conditions that are treated with conventional drugs. She also feels that the Holistic or Alternative approach to veterinary medicine offers more treatment choices, which in many cases are more effective, less traumatic, and have fewer side effects (if any) than allopathic medicine. Dr. Bamford and her staff provide these services. 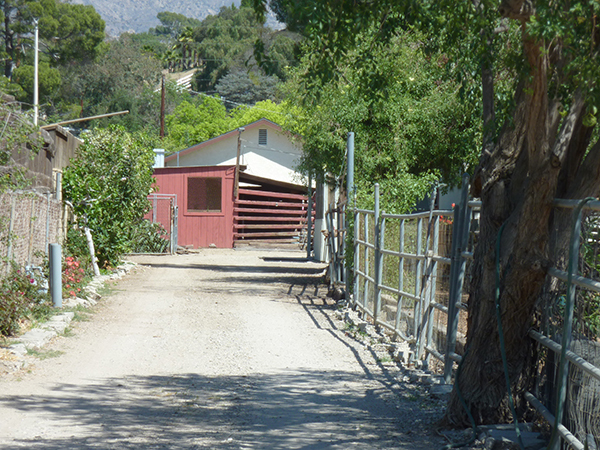 We believe that you will enjoy coming to our clinic located on our horse farm in Shadow Hills. The atmosphere is rural and the mountains are nearby. As we progress with landscaping we hope to create a restful place to meet with you and your animal companions. The clinic is low-key and situated in a country home. Many animals don’t realize that they are at the vet’s office. It doesn’t look like a veterinary clinic; best of all it doesn’t smell like a veterinary clinic; and there are no cold steel tables and few slippery floors! Plan to come a bit early and visit with the horses, mules and donkeys. It is best that you understand up front that this is a clinic. We treat animals here. We are not equipped to handle emergencies, critical care, or hospitalization. We have no surgical or x-ray facilities. We can perform most diagnostic laboratory tests; and we will work with you to set up a referral to a veterinary specialist or a veterinary hospital best equipped to deal with your companion’s need should these services be required. Dr. Bamford is the only doctor here. If an emergency occurs when she is not available, you are advised to go to another veterinarian or emergency clinic to preserve your pet’s life. We will gladly work with you during the recovery and rehabilitation phase once your pet has been stabilized. Some clients have found us because conventional—allopathic—veterinary medicine has left them without hope. In this practice we are often faced with very serious cases. Many animals respond dramatically to the change in treatment. Sometimes, however, the disease process is too advanced for reversal even using homeopathy. Then we work with you and your animal companion to assure the highest quality of life for the longest time possible; and we assist in preparing you both for a gentle end. Dr. Bamford accepts a limited number of new clients at the start of each quarter. If she has already accepted the number of new clients she can provide outstanding care for, in any given quarter, you can try again the following quarter. The outgoing phone message is also updated weekly and will state when the wait list will be opening up, closer to that date. Please send an e-mail to frontoffice@redrowan.com requesting an application for a cat, a dog, a horse, or some combination of the three. These will be e-mailed to you.